How do I collect outstanding balances after my participants have paid the deposit? Learn how WeTravel makes it super easy to collect any remaining amounts from your participants after you have collected a deposit. 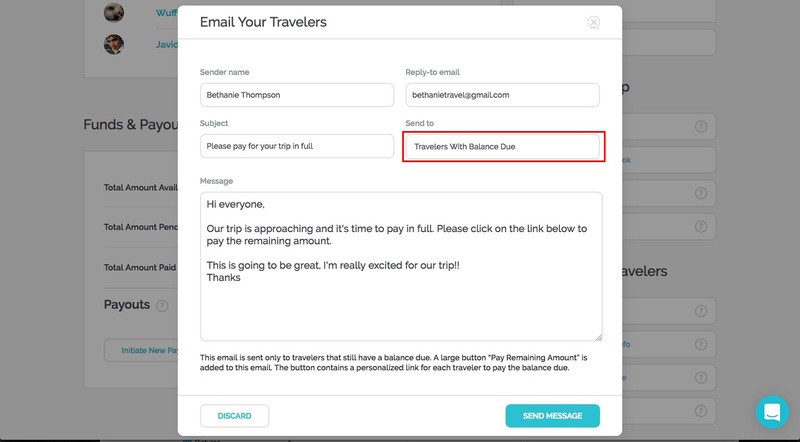 With WeTravel, you can collect the outstanding balance from your participant with just two clicks. Let's say you have a trip where 10 people have paid a deposit and it's time that they pay the rest. 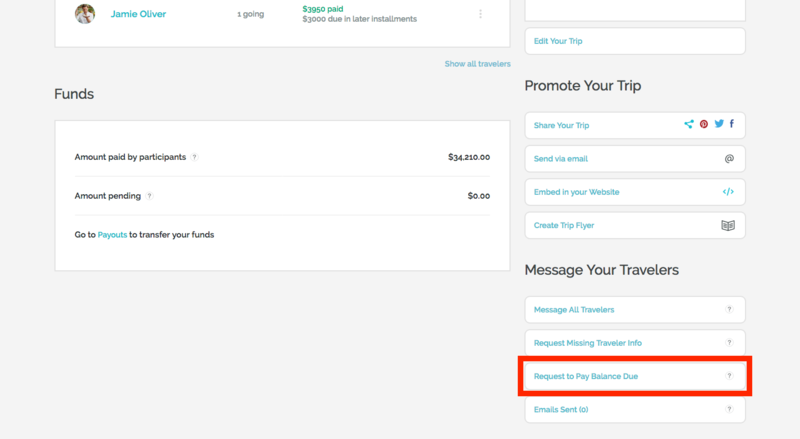 Go to "Manage Trip" and navigate to the lower right side to "Request to Pay Balance Due" in the Messaging section. 2. This will send an email ONLY to the people that still owe you money. This also includes people with payment plans that have their next installment due already (marked in orange). As you can see in "Send to", this sends an email only all participants that still have a balance due. 3. You can adapt the message if you wish and click "Send Message"
You're done!! Your participants will receive an email with a large button "Pay Remaining Amount". Clicking this button takes the participants directly to a personalized site to pay their balance due. Note: If you already know the date when the payment is due at the moment of creating your booking page, you can use our "Payment Plan" feature to automatically collect the outstanding amount. Learn more here.